“Not all attorneys are rhinos. There are some noble ones out there,” I replied. Jeffrey Marks came to mind. He was a potential adversary when we first met: he represented a struggling homeowner whose mortgage AHP had purchased. However, we ended up on the same side with the borrower and Jeff. “At any given time, AHP has 300 or so active legal actions across the country. These include foreclosures, evictions, quiet title actions, actions to set aside tax sales, lawsuits against insurers (title, mortgage insurance, and property), defending municipal actions regarding vacant properties, and others. Our #1 asset-specific expense is legal fees – by far. Our #1 challenge is keeping all the legal actions moving forward in an expeditious manner. Repeatedly, actions fall through the cracks at firms big and small, and we often find chasing down attorneys (who we are paying to act on our behalf) more difficult than chasing down delinquent borrowers. A competing mortgage fund found an interesting solution. They established a captive law firm and have gotten their attorneys admitted in more than two dozen states – the one where they commonly have actions. Thus, all filings for all their states are prepared in one location which also houses all support staff, so they can allocate resources wherever necessary. Further, when in-person appearances are needed, they typically engage a local attorney to appear. The only client of the firm is the mortgage fund, so there is no need to do business development or client relations. Four months later, we are thrilled to welcome Jeff as AHP’s General Counsel and Ava Touloupakis as Senior Associate General Counsel. Both were recognized as 2016 Rising Stars by SuperLawyers.com. 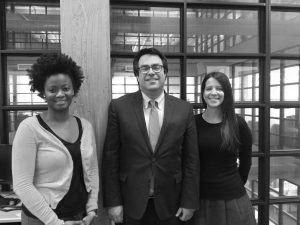 Christal Tarver, our Senior Litigation Resolution Specialist, rounds out AHP’s new rhino-free legal team. The vision of speedier borrower solutions, lower legal costs, and greater fund performance is now becoming reality.